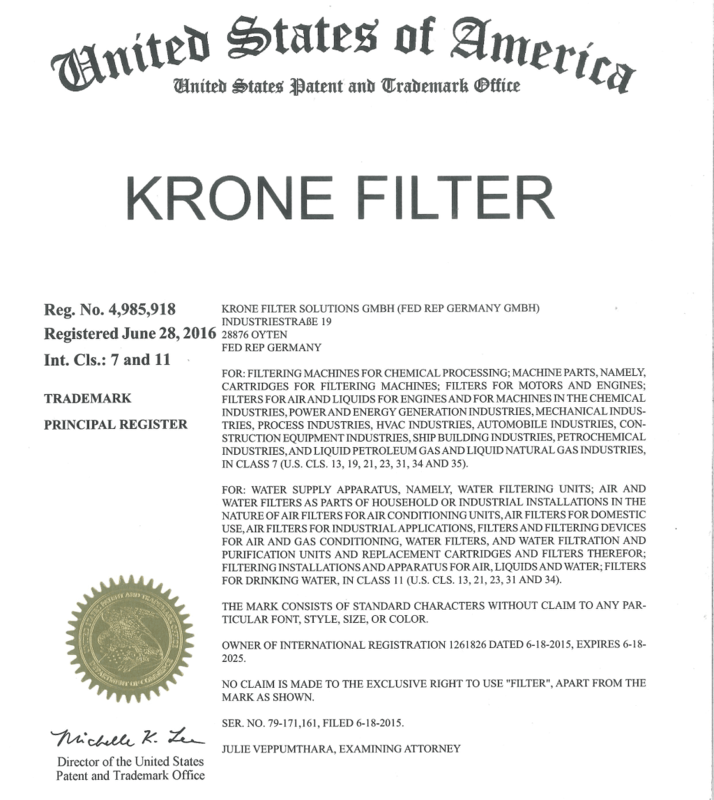 1) These general terms and conditions (subsequently referred to as terms and conditions) are the basis and constituents of all contracts concluded between Krone Filter Solutions GmbH (subsequently referred to as KFS) and its contracting partner (subsequently referred to as customer), the subject matter of which is the sales of goods and/or related goods and services of KFS. They shall therefore apply to all future business relations even if these are not expressly agreed upon again. 2) These terms and conditions apply exclusively. General terms and conditions of the customer deviating from these have no validity and are hereby expressly contradicted. To be legally effective, changes to these terms and conditions need an explicit written approval from KFS; in the event of an agreement these have priority over the terms and conditions. 3) These terms and conditions are deemed accepted at the latest with the acceptance of the goods or service. 4) These terms and conditions also apply to legal entities of the public law and special fund under public law. 1) Offers by KFS are non-binding. Subsequent amendments and additions are subject to change. Images in printed matters, weights and dimensions constitute approximate specifications unless these have been guaranteed in writing. 2) For the contract to come into effect, there must be written approval from KFS. This written approval together with the specifications determine with finality the contents of the contractual relationship and the scope of service. Subsidiary agreements and verbal statements including undertakings and guarantees by the employees shall become subject matter of the contract only if approved by KFS in writing. Only the die managing director and the authorized signatories are authorized to such a written confirmation. 1) All prices indicated by KFS are in Euro and include value-added tax. 2) In case of sales by dispatch, the purchase price also includes freight, packaging and insurance charges. 3) KFS is bound by the prices stated in its offers 30 days from the date of the offer. In all other cases, prices stated by KFS in the order confirmation shall apply. 4) Costs incurred on installation, training and additional services are not included in the purchase price unless other agreements have been made. 1) Unless otherwise agreed, KFS decides means and route of transport without being responsible for the selection of the quickest and cheapest option. 2) Delivery dates and periods must be expressly agreed by KFS in writing and shall only be agreed on an approximate basis. The delivery date is deemed to have been met if the goods have left the warehouse of KFS by the end of such date or confirmation of readiness for dispatch has been announced. 3) KFS is only responsible for the punctuality of its own deliveries and/or services, if it has itself (provided the relevant contracts with suppliers or subcontractors were concluded at an appropriate time) received the requisite deliveries and other services punctually. The burden of proof that KFS is responsible for breach of duty in connection with procuring supplies is the onus of the customer. Correct and punctual delivery by the seller shall be expressly reserved. 4) In case of force majeure, strike, shortage of raw material or other interruptions, the delivery dates shall be extended accordingly. In any such event or if KFS's suppliers encounter circumstances leading to considerable delayed performance and KFS cannot procure the goods, KFS shall be entitled to withdraw from the contract. Upon request from the customer, KFS shall declare whether KFS intends to exercise its right to withdraw from the contract or intends to deliver within a reasonable period of time to be agreed. 5) Deliveries shall be made from the warehouse of KFS on behalf of and risk of the customer. Place of performance in the legal sense of § 269 BGB are the headquarters of KFS. Risk of accidental loss or deterioration of goods passes to the customer upon delivery at the place of performance. In case sale to destination has been agreed upon expressly, risk of accidental loss or deterioration of the goods is transferred by KFS to the customer with the handover of goods to the freight forwarder, freight carrier or other person or institute specified for shipping the goods. Risk transfer is also the same if the customer delays approval. 6) KFS is entitled to make partial deliveries which shall in each case be payable separately. 1) Unless expressly agreed otherwise in writing, invoices of KFS shall be due for payment 14 days upon receipt without any deduction. If the customer does not pay, he is in default after the expiry of this term. In case of defects, the customer shall not have the right of retention unless the delivery is apparently defective or the customer has an apparent right to refuse the acceptance of the delivery. In such cases the customer shall only be entitled for retention as far as the retained amount is in reasonable proportion to the defects and the likely cost of supplementary performance (particularly remedying the defect). The customer is not entitled to assert claims and rights for defects if the customer has not made due payments and the due amount is in an appropriate relationship to the value of the defective delivery. 1) All delivered goods shall remain the property of KFS until all the claims of KFS against the customer arising from the business relationship have been satisfied. Should the customer violate his obligations, particularly if he should default in payment, KFS shall be entitled, even without setting a time limit, to demand recovery of the delivered goods and/or to withdraw from the contract. The customer is obliged to surrender the goods. A demand for the surrender of the delivered goods shall not constitute withdrawal from the contract by KFS, unless stated expressly. 2) The customer is obligated to immediately notify KFS about access to the goods by third parties, for instance in cases of a seizure of the goods and any kind of damage or destruction of the goods. The customer must inform KFS immediately of any change of ownership of the goods as well as any change to his address in writing. 3) The customer is entitled to sell the goods within the framework of a proper business transaction. Claims resulting from resale or another legal ground (e. g. insurance, unlawful act) regarding the goods are hereby now assigned by the customer to KFS to the full extent for the sake of precaution. KFS shall accept the assignment. After the assignment the customer shall be revocably entitled to collect the outstanding payment. KFS reserves the right to collect the outstanding payment directly if the customer does not discharge his payment obligations correctly. 1) KFS is not responsible for defects in the delivery procured from third parties and forwarded to the customer unchanged. This does not apply in case of intention or gross negligence. 2) Defect claims of the customer shall not apply if there is only a minor deviation from the agreed nature of the goods or only a minor impairment of usability of the delivered goods. 3) If deficiencies exists, KFS shall be entitled to choose between rectifying the defect and a new delivery. If subsequent performance fails, the customer is entitled to reduce the purchase price or withdraw from the contract. In any case, repair is considered unsuccessful after the third unsuccessful repair attempt. 4) The customer shall bear the necessary expenses for the purpose of subsequently fulfilling provided that these have not been increased because the goods were delivered to a different location other than the customer's location, unless such a transfer complies with its intended use. 5) The customer must notify the defects within 7 days from receipt of goods. Otherwise claims based on defects shall be excluded, unless the defect was not apparent. If a defect is detected later, this must be notified in writing within a period of 7 days. Timely dispatch shall be sufficient to observe the deadline. The customer shall bear the full burden of proof in relation to all preconditions for making a claim, particularly with regard to the defect, the date of detection of the defect and for punctual notification of defects. 6) If the buyer determines defects in the goods, then the goods may not be used, i.e. they may not be divided, resold or processed further until an agreement has been reached on the settlement of the claim or an inquiry procedure has been done by an assigned expert at the Chamber of Commerce at the headquarters of the buyer. 7) The customer shall bear the expenses for the purpose of subsequently fulfilling provided these have not been increased because the deliveries or services were delivered to a different location other than the headquarters of KFS unless such a transfer complies with its intended use. 1) KFS accepts liability in case of intent or gross negligence in accordance with the legal provisions. Otherwise KFS is only liable according to the German product liability law, on account of injury to the body, life or health or for culpable breach of essential contractual obligations. Claim for compensation with regard to breach of major contractual obligations shall however be restricted to foreseeable damages typical of the contract. Even in cases of gross negligence, liability of KFS shall be restricted to foreseeable damages typical of the contract if none of the exceptions set forth in sentence 2 of this paragraph apply. 2) If the operating and maintenance instructions of KFS are not followed, modifications are made to the product, parts are replaced or consumables are used that do not comply with the original specifications, any warranty does not apply if the customer cannot refute a substantiated claim that one of the circumstances caused the defect. 3) Liability for damages caused by the delivered goods to the goods belonging to the customer for example damages to other goods is excluded completely. This shall not apply in the case of malicious intent or gross negligence or liability exists due to injury to life, body or health. 4) Provisions of the above sections 1 and 2 cover compensation for damages besides the performance and compensation for damages instead of the performance, for any legal reason whatsoever, in particular for defects, breach of obligations under the contractual obligation or from unlawful acts. They also apply to a claim for reimbursement of futile expenses. 5) Where the performance of services is delayed, KFS accepts liability in case of intent or gross negligence in accordance with the legal provisions. In such cases, liability is restricted to foreseeable damages typical of the contract. Otherwise, liability of KFS for default in service for compensation in addition to service and compensation instead of service is limited to 10% of the value of the service. Further claims by the customer are excluded even after the expiration of a period set for delivery by KFS. Above restrictions shall not apply in the event of liability on account of injury to life, body or health. 1) The customer may only withdraw from the contract within the scope of the legal provisions, if KFS is guilty of breach of duty; however, in the case of defects, legal remedies shall apply. In case of breaches of duties the customer must declare within a reasonable deadline after request by KFS whether he shall withdraw from the contract owing to the breach of duty or insist on the delivery. 1) The period of limitations for claims and rights on account of defects - regardless of the legal basis - shall be one year. 2) Period of limitations according to paragraph 1 also applies to all claims for damages against KFS that are connected to the defect - regardless of the legal basis of the claim. The same applies to claims for damages of any type against KFS, which are not connected to a defect. 3) The period of limitations does not generally apply in the case of intent. This shall also not apply if the defect was maliciously concealed by KFS. In this case, the statutory limitation period shall apply instead. 4) The period of limitation of one year shall also not apply for compensation claims in case of loss of life, bodily injury or impairment to health or else violation of liberty, for claims under product liability law, for grossly negligent or else willful dereliction of duty or for violation of material contractual obligations. 1) Insofar as written form has been agreed or prescribed by the existing terms and conditions, this requirement shall also be met by facsimile transmission (fax) and by an electronic document from which the identity of the issuer can be established incontrovertibly. 2) All subsidiary agreements must be approved in writing by KFS. 3) Should a provision of the contract including the existing terms and conditions become invalid or has not been validly incorporated in the contract, this shall not affect the validity of the remainder of the provisions of the contract. Instead the legally permitted regulation that comes closest to the intended economic purpose of both the parties shall apply. 4) All legal relationships between the parties shall be deemed to be governed by the German law. Place of jurisdiction is Bremen.